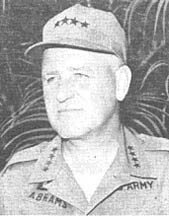 SAIGON (MACV) - President Johnson announced last week that GEN Creighton W. Abrams will replace GEN William C. Westmoreland as commander of the Military Assistance Command, Vietnam (MACV). GEN Westmoreland was nominated to become Army Chief of Staff. GEN Abrams, presently deputy commander to GEN Westmoreland, will be replaced by LTG Andrew J. Goodpaster who is serving as Commandant of the Army War College at Fort McNair, Washington, D.C. Goodpaster was a former aid to Presidents Dwight D. Eisenhower and John F. Kennedy. Both appointments were recommended by the Joint Chiefs of Staff as well as Defense Secretary Clark M. Clifford according to the President's announcement. GEN Goodpaster will also be nominated by the President for promotion to four-star general. Fifty-three-year-old GEN Abrams was a tank commander in World War II under GEN George S. Patton and during Korea served as Chief of Staff for I Corps, X Corps and IX Corps. In 1955 he became Chief of Staff at the Armored Center at Fort Knox, Ky.
During his nearly 32 years of military service since graduation from the Military Academy at West Point in 1936, GEN Abrams has served with the 1st Cav Div, 1st Armored Div, 4th Armored Div, 1st Inf Div, 2nd Armored Regiment and 3rd Armored Div which he commanded from Oct 1960 until May 1962. He has served in many other assignments in the United States and overseas. On Aug 3, 1964, he was appointed acting Vice Chief of Staff, United States Army. He came to Vietnam as deputy commander June 1 of last year. Among his many citations, awards and medals, the general has received the Distinguished Service Cross with Oak Leaf Cluster, the Distinguished Service Medal with two Oak Leaf Clusters, the Silver Star Medal with Oak Leaf Cluster, the Legion of Merit with Oak Leaf Cluster and the Bronze Star Medal with Valor Device. 2ND BDE - In some of the most bitter fighting since the Tet offensive, elements of the 25th inf Div under the operational control of the 2nd Bde and US Air Force tactical air strike killed more than 340 Viet Cong and North Vietnamese in action near Trang Bang, 54 kms northwest of Saigon. A total of 470 enemy were killed by US and South Vietnamese forces in the Operation Quyet Thang fighting which raged for three days near the Highway One district capital. The battle is believed to have stopped a new offensive against the Saigon area. Intelligence officers also said the three separate battles resulted in the virtual destruction of two new North Vietnamese Army battalions that recently had moved into Hau Nghia Province. The action began on March 24, when a company of the 2nd Bn, 14th Inf, airlifted into rice paddies near a small village 16 kms from the division base camp at Cu Chi. The 1st Bde soldiers came under heavy enemy rocket, mortar and automatic weapons fire. 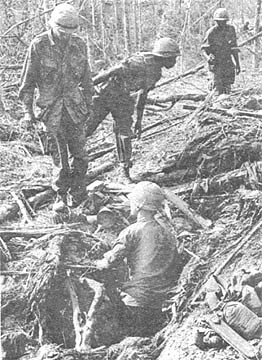 Repeated assaults into the village were turned back by entrenched enemy forces, believed to have been elements of the 7th Viet Cong Cu Chi Bn. Throughout the day, artillerymen poured more than 3,000 rounds of high explosives into the area. Air Force fighter bombers conducted 20 air strikes on the enemy positions. After the saturation bombing, the ground troops, aided by the reconnaissance platoon, 2nd Bn, 34th Armor, and four tracks from Co C, 4th Bn, 23rd Inf, pushed their way through the village. The Tropic Lightning soldiers found 87 enemy dead, 21 of them killed by the air strikes. The battle began shortly after 8 a.m. and lasted more than 18 hours. The second battle began at 9 a.m. on Monday, when elements of the recon plt, 4th Bn, 23rd Inf, and engineers came in heavy contact as they were sweeping Highway 12 kms east of Trang Bang. Two other companies of the 23rd Inf swept into the area to reinforce the road clearing team, and also came under heavy enemy ground attack. Helicopter gunships, artillery and air strikes supported the infantrymen throughout the day, until contact was broken around 7 p.m. 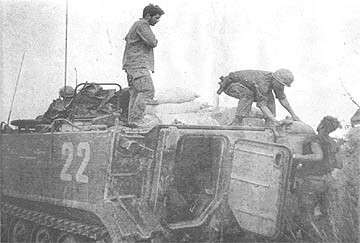 In sweeping the area the next morning, the 1st Bde soldiers counted 85 enemy dead, including two women who had attempted to knock out an armored personnel carrier with an RPG-2 rocket launcher. Among the enemy officers killed were a major and four company commanders. To the north, elements of the 2nd Bn, 34th Armor, recon plt, tracks from the 23rd Inf and two tanks had attempted to move south to reinforce the US and ARVN troops defending Trang Bang when they, too, became heavily engaged. In 12 hours of hard fighting, the task force killed over 25 Viet Cong, while air strikes accounted for 16 more. The US troops further detained two Viet Cong suspects. Gunships supporting both actions were credited with 30 enemy killed. On the following day, the 2nd Bn, 14th Inf, again engaged a dug-in enemy force, four kms west of their battle two days before. In a re-run of the first action, a "Golden Dragon" company airlifted near the small village of Ap Long Muc and immediately received heavy rocket and automatic weapons fire from the three to four hundred man enemy force. Two more companies landed near the battle, but determined assaults again were halted by the entrenched Viet Cong and North Vietnamese. Air strikes and artillery pounded the enemy fortifications until early the next morning, when the infantry battalion and elements of the 2nd Bn, 34th Armor, the 4th Bn, 23rd Inf, and the 1st Bn (Mech), 5th Inf, assaulted the village from the south and east. Fighting lasted until 4:30 p.m. that day as the US troops swept through the area. Air strikes had accounted for more than 50 enemy dead, while ground fire and artillery killed at least 45 more. Throughout the three day period, the 2nd Bde forces had captured 37 AK-47 assault rifles, 12 machine guns, three small arms, nine RPG model rocket launchers, a 60 mm mortar and thousands of rounds of small arms, mortar and RPG ammunition. 3RD BDE - The Co call themselves the "Alphagators." Their commanding officer, CPT Herbert C. Chancey, and many of the men of Alpha Co, 3rd Bn, 22nd Inf, are natives of Florida. So, it seemed natural that the 3rd Bde, 25th Inf Div, unit should choose a Fla alligator as their mascot. "I wrote Governor Kirk and explained the situation to him," stated Chancey. "He replied a few weeks later and said he'd be glad to send us a mascot." Alpha Co has a pool ready and waiting for their mascot, who has already been named "Gator 6." 2ND BDE - At least 10 Viet Cong have been killed by 2nd Bde, 25th Inf Div, night ambush patrols blocking enemy infiltration routes into Saigon. The 2nd Bde forces, forming a defensive line from the capital's northwest sector down to its southwestern suburbs, also captured numerous weapons in night contact with the Viet Cong attempting to move men and materiel toward the city. A night ambush patrol from Co B, 2nd Bn, 27th Inf, and one from Co D, 2nd Bn, 14th Inf, opened fire on small Viet Cong parties moving by their positions. The patrols detained one enemy each. 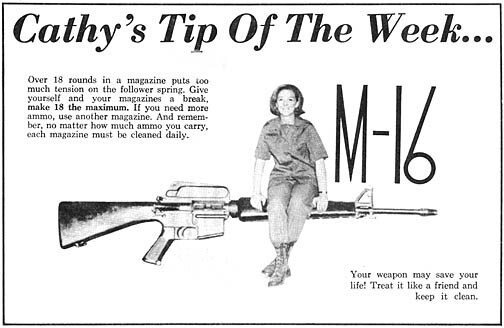 The 14th Inf unit also captured an AK-47 assault rifle. The following night, another 2nd Bn, 27th Inf, patrol engaged a small enemy unit. 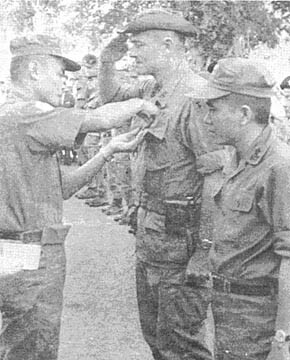 The "Wolfhounds" killed three Viet Cong and captured three weapons and several documents. A night patrol from the 1st Bn (Mech), 5th Inf, ambushed two Viet Cong killing both enemy and capturing two AK-47 assault rifles and 14 RPG-2 rounds. The next evening, other soldiers of the "5th Mech" challenged a solitary Viet Cong as he passed their ambush site. The Viet Cong tried to escape, but was cut down by small arms fire. 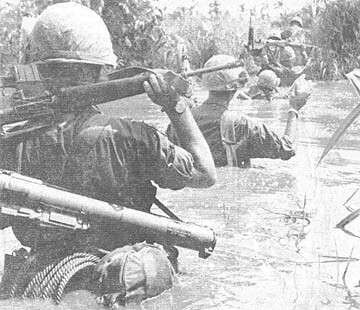 An ambush patrol from Co B, 1st Bn, 27th Inf Wolfhounds, killed two enemy in a sampan who floated by their position along a canal near Hoc Mon. On the fourth night, a patrol from Co A, 2nd Bn, 14th Inf, engaged eight Viet Cong who were approaching their ambush site near the division base camp at Cu Chi. The 1st Bde troopers killed two Viet Cong and captured a 60mm mortar tube and an RPG-56 light machine gun. WASHINGTON - The relief of the forces which have held the base at Khe Sanh is an occasion for me to express the pride and confidence I feel in those who are carrying forward the nation's struggle against aggression in Southeast Asia. Side by side with your South Vietnamese comrades - and our other fighting allies - you have taken the full initial weight of the enemy's winter-spring offensive; and you have now seized the initiative. The enemy intended to destroy the constitutional government of South Vietnam and its armed forces. In this he failed. The enemy intended to overrun the base at Khe Sanh. For this purpose he emplaced around that base at least two divisions of North Vietnamese Regulars. Less than 6,000 U.S. Marines and South Vietnamese Rangers - backed by our tremendous air capacity - pinned them down, kept them aways from the populated areas at the peak of the winter-spring offensive; and imposed heavy casualties. Now the siege of Khe Sanh is lifted. But clearly the fighting in South Vietnam is not yet at an end. The enemy may throw new forces into the battle. You, I know, intend to continue to move forward. But by your gallant and skillful support for the brave people and Armed Forces of South Vietnam, you have brought near the time of peace in that suffering land and in all of Southeast Asia. As we seek now to find through negotiations an honorable peace in Vietnam, I wish you to know that we are grateful for what you have already accomplished and will be counting on you more than ever, until the blessed day when the guns fall silent. LONG BINH, (USARV-IO) - The $200 per month limitation on personal currency transactions involving military payment certificates (MPC) which was originally planned to go into effect March 1, is now scheduled to begin on May 1. Unfortunately there is still a good deal of confusion on just what this limitation will mean to U.S. military personnel in Vietnam. First, why the limitation? What good does it do? This is a measure taken by the Armed Forces to control the black market and hinder currency manipulation. Unofficial sources say that currency manipulation has become a multimillion dollar industry and in some cases brings U.S. dollars into the hands of the enemy, who in turn buy war supplies with the dollars. Does the limitation mean that military personnel are limited to spending $200 each month in the PX, or in Vietnam? There will be no limit fixed to the amount of money that may be spent in the PX or anywhere else in Vietnam. For example, there is nothing to prevent you from buying a $300 tape recorder. What is the restriction on then? The limitation concerns itself with money orders, treasury checks or Traveler's checks in excess of $200 each month. The reason behind this is the fact that the quickest way to change MPC into U.S. dollars is to buy a money order with MPC which is then redeemable in U.S. currency. The underlying reason for the limitation is to prevent money manipulation. The manipulators seek to convert piasters and MPC into U.S. dollars which have buying power all over the world. MPC in itself can only be used by authorized U.S. personnel and can not be used on the open market. Piasters are more easily negotiable, but they must also be converted into another monetary form eventually. By converting piasters and MPC into U.S. dollars, the manipulators are able to purchase weapons, ammunition and other war supplies. Those who sell these commodities are more eager to accept U.S. dollars than piasters or MPC. The $200 limitation will put a ceiling on the amount of money that can be sent back and exchanged in this manner, and will discourage the exchange of U.S. dollars for piasters and MPC. What if your family has an emergency or your wife needs money? If this occasion arises, you can obtain the permission of your commanding officer to send home an amount in excess of $200 if needed. However, don't try to do it without official permission or you may be reported to the Provost Marshal. What about the restrictions on buying items in the PX? What this means is that starting May 1, a computer record will be kept of the large money-value purchases that you make at the PX. This will include items such as cameras, televisions, tuner amplifiers, refrigerators, fans, radios, automobiles and airline tickets. These are generally the sort of items that find their way to the black market. There will be no restriction on buying such items but a careful record will be kept of the number of such purchases on a computer card. Are there any exceptions to the $200 limitation? Certainly. When your tour of duty in Vietnam is ended, or when you go on leave or R&R, you are allowed to convert as much cash as you have, regardless of amount, provided you can satisfy your commander that it represents military payment certificates legitimately acquired by you. If your pay is going into a checking account, the checks that you write will not come under the limitation. In Vietnam, there is really no such thing as a savings account or a checking account. What we have is a combination of both. You receive a savings account rate of five percent interest but you can also write checks on your account, which are payable in U.S. dollars outside of Vietnam, or MPC in Vietnam. The best way to avoid being placed in a position where you will have too much MPC to convert into U.S. dollars is to reduce the amount of across the board pay you receive to an amount within the $200 limit. This may be done in several ways. You can arrange to have a portion of your pay transferred into U.S. Savings Deposits, which will reduce the amount of pay you actually receive on pay day and earn 10 percent interest. Another way is to convert some of your pay into U.S. Savings Bonds. Remember, the $200 limitation does not restrict your ability to buy. It is designed solely to hinder the operation of the black market and money manipulators. SAIGON (MACV) - Officials at Red Cross national headquarters are convinced that ex-servicemen are among the best field directors and are actively recruiting them. The buildup in Vietnam increased demands upon the Red Cross and created the need for more field directors. Following an initial orientation-type course, new personnel are placed around the States with Red Cross units for on-the-job practical training. At the conclusion of these preliminary periods they can expect to serve a one-year tour in Southeast Asia where 155 field directors are now handling an average of 22,000 emergencies monthly. Primarily, these Red Cross representatives handle family and personal crises-caused problems for the servicemen and provide emergency communications with home regarding a family's health and welfare in order to ease the fighting man's concern. EAST: 615 North St. Alexandria, Va.; MIDWEST: 5050 Lindell Blvd., St. Louis, Mo. ; SOUTHEAST: 1955 Monroe Dr., N.E., Atlanta, Ga.; WEST: 1550 Sutter St., San Francisco, Calif. The new recruit starts as an Assistant Field Director at an annual salary ranging from $6,308 to $9,114, plus fringe benefits. WASHINGTON (AFPS) - The 1968 edition of "Federal Benefits for Veterans and Dependents" is now available from the Government Printing Office in Washington, D.C. Published by the Veterans Administration, the new booklet reflects new legislation changes including the Veterans' Pension and Readjustment Assistance Act of 1967. Among other legislative changes, this Act gives Vietnam veterans the same benefits available to other wartime veterans. Single copies may be obtained for 20 cents from the Superintendent of Documents, U.S. Government Printing Office, Washington, D.C. 20402. 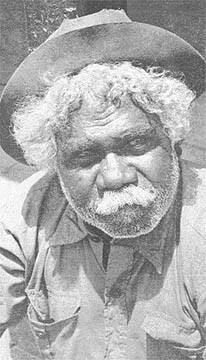 A colorful "local" is this Australian Aborigine. The newest of R&R countries, Australia offers three funspots for your choice - Gold Coast, Brisbane, and Sydney. The 'land down under' has an abundance of sun, sand, surf, 'Sheilas', and if you're interested kangaroos! 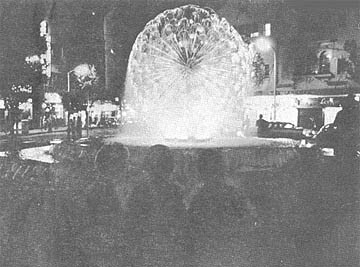 Victory fountain in Queens Park, Kings Crossing, is a sparkling, bubbling color-lit attraction near the heart of Sydney's hotel and night club district. An old cannon faces the sea from Tobruk Memorial Park. Surf, sun and sand create a paradise in Australia's resort town of Gold Coast. The 1st Bn (Mech), 5th Inf, searching a wooded area near the Saigon River recently uncovered and destroyed a huge enemy base camp. 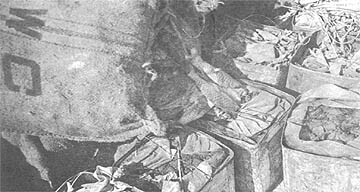 The Viet Cong complex contained more than 80,000 pounds of rice along with hundreds of pounds of canned goods, peanuts, beans, sugar, dried fish and cured meat. The 25th Inf Div "Bobcats" pulled up their amored personnel carriers and loaded the 100 pound bags of rice onto them. The mechanized infantry, under the command of LTC Thomas C. Lodge, evacuated the huge food cache. CPT John Theologos, a former company commander with the Bobcats, and the Bn Chaplain, CPT Robert Falabella, organized a truck convoy to carry the food to the Viet Hoa Orphanage in Saigon. A "Bobcat" heaves a 100-pound bag of captured rice aboard an armored personnel carrier. Fish and rice, staples of the Viet Cong's diet, sit stacked awaiting evacuation. 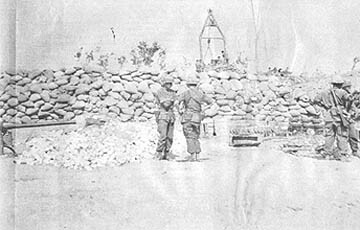 Standing in front of a wall of captured rice, members of the 1st Bn (Mech), 5th Inf, survey the massive enemy supplies they captured. 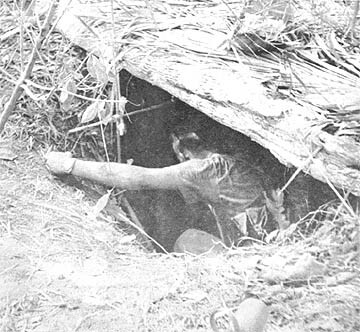 A Tropic Lightning soldier searches a Viet Cong bunker located in the regimental size base camp. 1ST BDE - A company of the 25th Inf Div recently destroyed a North Vietnamese Army (NVA) survey team in action during Operation Quyet Thang in the HoBo Woods. The enemy force lost seven killed when they opened fire with automatic weapons as Bravo Co, 2nd Bn, 14th Inf, conducted a reconnaissance in force operation through the heavily fortified area. LTC Alfred M. Bracy of Petersburg, Va., B Co, called in air strikes and artillery on the entrenched enemy. After the hour-long firefight, the "Golden Dragons" located the enemy bodies and several items of surveying equipment, including an aiming circle. "The dead enemy were dressed in brand new fatigues and all their personal gear was new," said 1LT Antonio F. Sanpere, Co B CO from Columbus, Ga. In addition to the survey equipment, the enemy force lost six AK-47 assault rifles, 18 magazines and 400 rounds of small arms ammunition. WASHINGTON - Military retired pay over a lifetime is worth up to nearly half a million dollars, according to calculations just made by the Defense Department. Near the low end is the E-5 who retires with 20 years' service and who over the rest of his life will draw $71,974 in retired pay. On the high end is the Chief of Staff who retires with 30 years of service. He can expect to draw $481,706. The total lifetime retired pay figures are for those retiring on the rates effective after April 1, 1968 (when a 3.9 percent raise is effective), and on the life expectancy tables used by insurance companies. The calculations consider the entry age in the military for officers to be 23 and 19 for enlisted men. These are non-disability retirements. Men retired for disability have a higher death rate and so they figure to get less. The figures are also based on the assumption that the years of service for pay purposes are the same as the years of active service. The figures show dramatically what is at stake for servicemen and the government in the present retirement system. The system is being reviewed by the Defense Department, and those making the study say that any new plan they come up with will not diminish the total income for retires although it may rearrange the manner and time of the payments. One such proposal envisions a two-step system. The first step would pay one rate for men when they leave active duty and then a higher rate at a later age when they may be expected to leave the civilian work force. About 90 percent of the military retirees would go into second careers after they leave active service. 2ND BDE - It was a great place for an ambush, but there just wasn't room for the two of them. At least, that's what a 25th Inf Div ambush patrol and a Viet Cong force found out when they set up in opposite corners of a hedgerow, unaware of each other's presence. 2LT John A. Connell of Southport, N.C., a platoon leader of Co B, 1st Bn, 27th Inf "Wolfhounds," was given a patrol assignment. "When we got to the ambush site, we changed the location and set up in the near corner of a hedgerow facing a rice paddy," he explained. SP4 Joe G. Martinez of San Antonio, Tex., led his rear security team to its position on the ambush, and then heard movement along the hedgerow. "We popped a claymore, and that popped one of Charlie's claymores," the team leader recounted. "Then there was lead flying all over the place." The Wolfhound patrol called artillery on the enemy positions, while both forces exchanged heavy automatic weapons and grenade fire. After the enemy broke contact, the 2nd Bde troops searched the area and found several large blood trails. "We were expecting to hit something," Martinez added, "but not that way, with the VC already there." 3RD BDE - A strange cat and mouse game on the Saigon River resulted in another successful mission for a unit of the 3rd Bde, 25th Inf Div. "We learned that the Viet Cong had established an ambush down river and set out to destroy it," explained 1LT Wayne France, platoon leader from Alpha Co, 3rd Bn, 22nd Inf. With his company stationed on a small river just off the Saigon, France and two squads boarded a gunboat and headed downriver. As the boat drew near the enemy position, 1LT James W. Carpers, artillery forward observer for A Co, called in gunships and artillery behind the onshore ambush site. Simultaneously, the "Regulars" cut loose with .50 caliber machinegun and small arms on the cornered Viet Cong. The combined attack destroyed the ambush position and killed two of the enemy. Numerous blood trail indicated that this Viet Cong ambush definitely backfired. 2ND BDE - It was a different sort of ordinary day for the men of the 5th Mech. They had been through the area 10 days before, and the going had been rough. The Viet Cong had been firing from reinforced bunkers, shooting everything from RPG's to .50-caliber machine guns. The Americans pulled back and waited for air strikes and artillery to slam into the area, followed by a second three-wave assault of ground troops, tanks and armored personnel carriers. They made it through the second time, and it was understandable why the Viet Cong had fought so hard. The area had housed an enemy battalion, its weapons and supplies. So the men of the 25th Div's 1st Bn (Mech), 5th Inf. cleaned up the place and left. When they returned 10 days later, they expected to find nothing worth the effort. What they discovered was that the Viet Cong had tried to outfox them; instead, the Americans outwitted the enemy. "The VC moved back into the area, planting caches in old and destroyed bunkers, thinking they would be safe now," said 1LT Harold V. Metzger Jr., leader of Co B's third platoon. PFC Augustine Gomez, a rifleman from Antonchico, Mex., was the first to spot the enemy munitions. Scraping away a mound of dirt and bamboo, Gomez uncovered 74 RPG-2 rounds. Continuing the search, PFC Randall J. Berkel of South Bend, Ind., dropped into an enemy bunker. "Yeah, this is it!" he shouted, and began to pass out 71 more anti-tank rockets. At the same time, PFC Gene Watkinson, an artillery forward observer from the 7th Bn, 11th Arty, located a .50-caliber Chicom machine gun with an extra barrel, tripod and antiaircraft harness. Minutes later, SP4 Ronald C. Kramer of Warren, Mich., checked out a bunker he had spotted through the dense undergrowth. It contained 20 more RPG-2 rockets. By the end of the day, the 5th Inf soldiers had captured and destroyed more than 200 enemy rockets; enough, as one man said, "to do an awful lot of damage to a mech unit." Around noon, Co A of the battalion began to receive sniper fire from the left. The company returned fire and gave chase, but there were no results to the action. It was, all in all, an ordinary day. The Tropic Lightning soldiers had engaged in a brief fight, uncovered enemy supplies, and destroyed still another enemy base camp. "We came through Charlie's back door," said CPT Patrick E. Stankevitz of Green Bay, Wisc., Co B CO, "and cut off his supply route back to his cache." CU CHI - A joint US-South Vietnamese force detained four Viet Cong and killed a fifth when an ARVN lieutenant sensed something was wrong ahead. Co A of the 25th Inf Div's 4th Bn (Mech), 23rd Inf, was conducting a reconnaissance-in-force four kms north of Trang Bang accompanied by two platoons of ARVN infantry. As the troops swept towards a hedgerow, an ARVN lieutenant sensed something "wasn't quite right," according to company commander CPT Gordon R. Lam of Honolulu. Lam ordered his armored personnel carriers to halt while the Vietnamese officer shouted something into the woodline. "Almost immediately," Lam recounted, "five VC popped up their heads from a trench. Four of them threw down their weapons, and with their hands over their heads started walking toward us." The fifth Viet Cong, apparently the group's leader, tried to escape. The allied force killed him with small arms fire. 3RD BDE - Night resupply in the area north of Saigon has become a fatal job for the Viet Cong. Operation Saratoga brought the 3rd Bn, 22nd Inf, of the 3rd Bde, 25th Inf Div, into the Tan Son Nhut area where VC and NVA regulars had been utilizing the hundreds of small rivers and canals to transport troops and rockets close to the capital. To stop the infiltration, the "Regulars" have met Charlie on his own terms, at night. Each night, part of the Bn moves out into the canals and streams of the surrounding fields to intercept the Viet Cong as the enemy comes out of hiding. In four weeks, the 3/22 has accounted for over 60 VC killed and 18 enemy sampans destroyed. Coupled with intensive daylight sweeps, the Regulars highly effective night operations have markedly reduced Viet Cong rocket attacks in the Tan Son Nhut area and denied Charlie one of his key weapons, freedom to operate at night. 1ST BDE - The 4th Bn, 9th Inf "Manchus" of the 25th Inf Div were grinding forward through five foot deep rice paddies 8 kms north of Saigon when they encountered a Viet Cong Bn size force, killing 26 enemy soldiers in a battle lasting seven hours. "As Bravo Co was searching a bunker complex, they received intense small arms, automatic weapons and RPG fire to their front. Meanwhile Co C and B maneuvered to the enemy's flanks and initiated a spray of firepower that caught the enemy in a cross fire," CPT Lawrence Graves, Bravo Co commented. "It was too close to call in air strikes," Graves of Wheatridge, Colo., continued. "We fought long, hard and good; the enemy was beaten and he knew it." "I've never seen so many heroic actions in one place, at one time," Graves said. One typical act of heroism was the actions of SP4 Robert Spuehler, radio telephone operator for Bravo's 1st Plt, who crawled 75 meters down a road through hostile fire to lead several wounded men to safety. Four AK-50's and two RPG rocket launchers were captured from the enemy. There were 26 enemy killed in the action. 1ST BDE - Three members of a 25th Inf Div rifle Co miraculously survived an enemy mortar round that crashed through the roof of their sandbagged bunker and exploded in their midst. Although the explosion extensively damaged the bunker and destroyed all the equipment inside, none of the trio of 2nd Bn, 14th Inf soldiers received even a scratch. SGT Michael Esser of Middleton, Wisc., and SP4 James L. Chapman of San Antonio and John E. Hart of St. Joseph, Mo., had taken refuge inside the shelter when Viet Cong mortar rounds began dropping into their forward location 48 kms northwest of Saigon during a 2nd Bde operation. Esser, who had only 20 days left to serve in Vietnam, later said he could hear the Viet Cong walk the mortars in toward his position. Three rounds had landed inside the Tropic Lightning forward base when the 82mm mortar round burst inside Esser's bunker. The explosion sent shrapnel flying up and out, Esser said, but somehow missed the three men huddled in the corners. Dusty and shaken, Esser crawled from the bunker. "I got out and looked up to see if there was still daylight outside," he said. Chapman recalls that "the first words I said after I got out of the bunker were, 'Thank God I'm alive!'" Hart learned a lesson from his incredible escape. "Sometimes I get mighty tired of continually filling sandbags, but now I'm a believer. I think I'll just dig a little deeper and fill a few bags more," he said. "Some of the guys claimed we looked like pigs after we came out of the bunker, but we didn't care how we looked as long as we came out alive," Chapman added. Clearing out the bunker, the trio discovered that all their web gear, weapons and other equipment had been destroyed by the shrapnel. They attributed their survival to lying low in the corners at the time the round detonated in the center of the bunker. 3RD BDE - An unusual rocket cache in the Saigon area was discovered by the 3rd Bn, 22nd Inf, 3rd Bde, 25th Inf Div. As Charlie Co was sweeping through the rice paddies northwest of Saigon, PFC Rex Sloane stumbled upon what appeared to be a dud 105mm howitzer round. On closer examination the missile was identified as a Viet Cong 122mm rocket. "When the platoon continued probing along the same rice paddy dike, we made a surprising discovery," explained 1LT Jan K. Pierson, 4th Plt leader from Emerson, N.J. "Instead of burying all of the rockets together, the VC had made six caches of three rockets each with the groups six paces apart." On an adjacent dike the "Regulars" unearthed a similar system of warhead caches. These groups of three were three paces apart. Eighteen carrying packs were also discovered in nearby holes. "We found signs of a complete rocket launching operation," added Pierson. "Footprints on the riverbank indicated that the VC had shipped the rockets here by sampan, and a patch of scorched earth in the middle of a rice paddy revealed the launching site." 1ST BDE - An urgent request for additional smoke grenades during a 2nd Bde, 25th Inf Div, fire fight near Trang Bang, brought about an unusual target for supporting gunships. Men of Bravo Co, 2nd Bn, 14th Inf, ran low on smoke grenades in a day long battle and needed more for marking their position as air strikes and artillery zeroed in on the enemy battalion to their front. The heated battle prevented the safe landing of a helicopter for resupply. The only other recourse was to drop the grenades from a low flying chopper. Positioning themselves tight against a rice paddy dike, the "Golden Dragon" troopers waited as a marking gunship swooped low dropping a smoke grenade on a nearby haystack, the only prominent landmark near the company. After the marker detonated, a second gunship flew in and dropped the emergency resupply of grenades on the haystack. "The gunships flew fast as he dropped the grenades because 'Charlie' was really putting out the rounds," said SP4 Bobby Lones of Jonesboro, Tenn.
WASHINGTON - The Hubbell pay study has been shelved for this year, officials say, and so has the "selective" pay raise proposal. Instead, there will be a 6.9 percent across-the-board hike in basic pay, probably effective July 1. If the across-the-board 6.9 raise comes July 1 as expected (there is still some dispute about the wording of the law) it would be the first of two automatic raises. Another one is in store for July 1, 1969. The amount of that raise would be determined later.